As individuals, many of us have our own point of view on this topic based on learning and experience. But answering this question where it counts, at the level of the USDA and the NOP, calls upon skills that must have been handy in settling some of the early church debates about the nature of God. It ends up requiring a very careful reading of original texts, a thoughtful analysis of past canonical decisions, and mustering a significant majority of votes at key gatherings. In the last couple of years many small organic growers, whose markets are being taken over by hydroponic competition, have pressed the NOP to disqualify soilless organic operations. They have called rallies and demonstrations, sponsored petitions and press releases, and lobbied groups for support. To back up their positions both sides of the debate have been busy. The wording of the OFPA has been scrutinized, various historical decisions of the National Organic Standards Board (NOSB) have been compared, a special Hydroponic and Aquaponic Task Force has been appointed and has reported, a recent meeting of the NOSB was tasked with deciding the question but couldn’t, the topic has become an example, in Congressional testimony at the Senate Agriculture Committee, of the need for “reforming” (weakening) organic program restrictions, and now a decision is on the docket for the fall 2017 Jacksonville meeting of the NOSB. This issue of The Natural Farmer is designed to help you, dear reader, fully understand the question. To do so we cite the wording of key documents, relevant early decisions, and contemporary opinions. We also explain the long history of water based growing, explain the various hydroponic systems currently in use, and interview individuals active in running and certifying “organic” soilless production. We have made an effort to present both sides as transparently as we can, and given them roughly equal time. We hope this is helpful to you and urge you to make your feelings known about this topic. 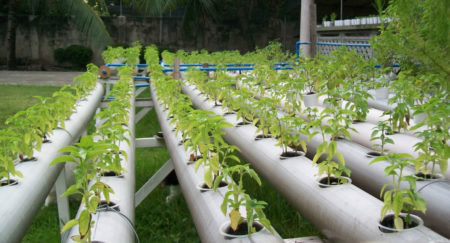 Like genetic engineering, sludge, and irradiation, hydroponics is a controversial method in the organic movement. All stakeholders should weigh and consider the various points of view and participate in a decision that it is either not allowed, or if allowed, in exactly what ways. It should not be left up to individual certification programs. That just invites “certifier shopping” and a continual strain on program integrity.